Have y'all tried buying or selling at Tradesy yet? I describe it as a combo between ebay and Ruelala. It's re-sale, like ebay. But you need an "invite" like Rue. And it primarily sells designer clothing, shoes and accessories. First I picked up this fantastic pair of Tory Burch ballet flats. They are the Reese, not Reva, and I love them! I think they are more comfortable than Revas actually. They were described as "like new" and that was very accurate as they have no signs of wear. Perfect! And because I would want to know, I'll share that I paid $100 for them. I call that a steal! And second, how cute is this Land's End tote bag?! I'm a big fan of LL Bean and Land's End totes. 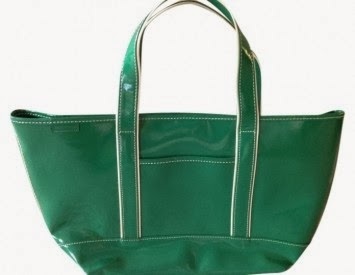 This green bag is patent leather though. I've never seen it in stores but it still had the original tag on it. Never worn. I paid $17.50. Oh and those prices included shipping! Unlike most places where shipping is an additional fee, the price you see already has shipping built into it. My only criticism of the site is that when you do a search for an item, it shows you both the items available and those that were previously sold. I wish there was a way to filter out items that have been sold. But if you are selling something, I'm sure seeing those prices is helpful. Anyway, if you are searching for new-to-you items like Lilly Pulitzer dresses or Kate Spade bags, give Tradesy a glance. So far, I've really been pleased with the website. Have you tried Tradesy? How was your experience? Did you buy or sell items? Thanks for the intro to a new site! I think I found the answer to your problem: on the left side bar where you can sort by designer, price, etc., there is an availability box where you can check "in stock" as an option. It doesn't list the sold items then! Ooooh I love that Tory Burch flats. I've been eyeing one to keep in my bag whenever I get tired of my heels. I wanted to get some Tieks, but haven't been able to pull the trigger bc they are a tad expensive! Maybe I can find a pair at Tradesy on the cheap. No I haven't. And to be honest it's the first time I heard of it, so thx for sharing the link and your experience. Sounds like a good deal!!! Would you like to follow each other on GFC? Please let me know on my blog so I can follow back. Thank you. I've sold some items on Tradesy, it's easy to use! I've actually never heard of Tradesy's before but it sounds like a fabulous idea, I'm glad you reviewed it. FYI, I'm hosting a dog collar giveaway on my blog, thought you would want to enter because I know you're a dog lover!